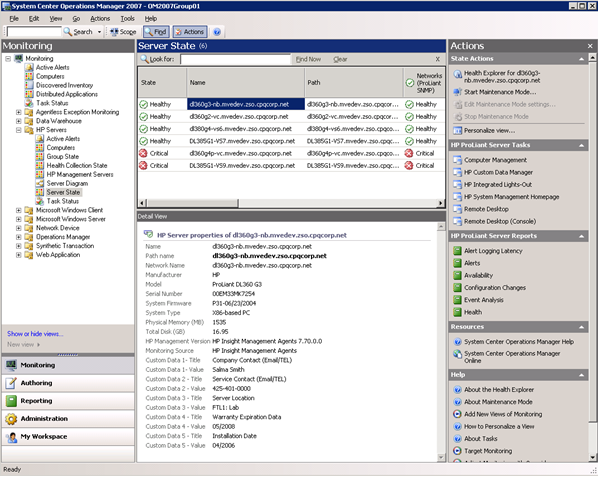 The Operations Manager 2007 Console provides a collection of folders and windows for viewing information stored in the Operations Manager database. 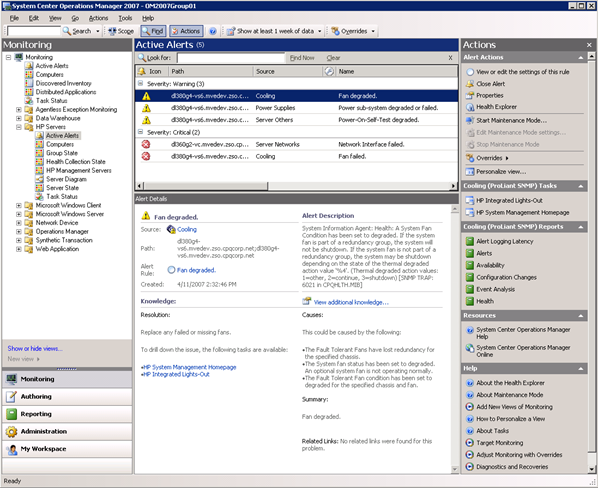 The HP ProLiant Server Management Packs for Operations Manager 2007 include predefined HP server views that present information about each HP server and associated alerts. HP Servers--This is the root folder that includes all HP server related views. HP Servers/Active Alerts--This view displays all active alerts generated by Collection classes. HP Servers/Computers--This view displays all HP computers. HP Servers/Group State--This view displays the state view by Groups. 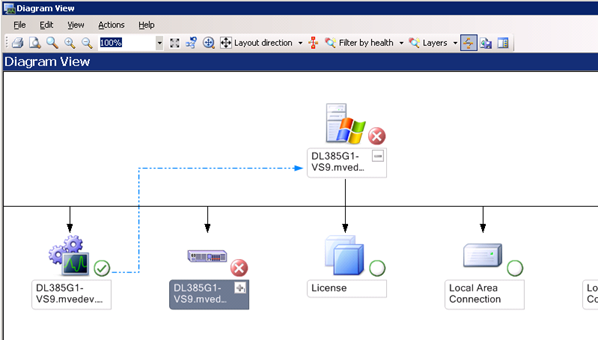 HP Servers/Health Collection State--This view displays the state view by Collection classes. HP Servers/HP Management Servers--This view displays the state view of HP management server software such as the HP Systems Insight Manager. HP Servers/Server Diagram--This view displays the diagram view starting with the HP Servers Group. HP Servers/Server State--This view displays the state view for HP servers. HP Servers/Task Status--This view displays the task results. Only remote tasks appear. NOTE: There are Integrated Management Log tasks available with ProLiant Server Management Packs. These task statuses display on the Task Status view. The Active Alerts view shows all active alerts associated with HP health collection classes. To display details for an individual alert, select the alert from the Active Alerts pane. 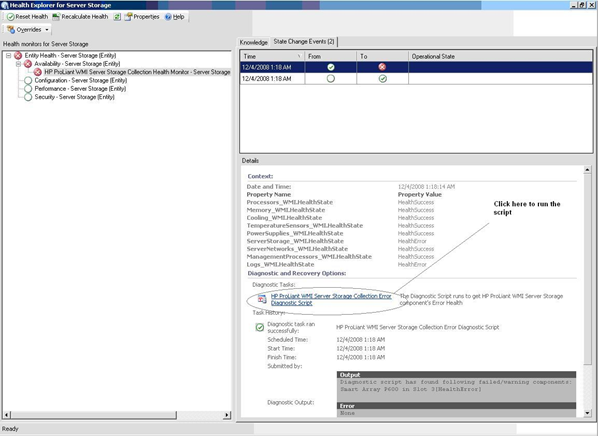 The Alert Details pane shows HP Knowledge base text with the originated NT® Event message in the Alert Description. The predefined event processing rules included with the HP ProLiant Server Management Packs for Operations Manager 2007 are designed to automatically identify and display HP ProLiant server events received in the Windows® Event Log as Operations Manager 2007 alerts. The HP alerts contain server hardware and services information that enable you to identify the cause of an issue and implement a timely and effective response. The Product Knowledge tab indicates suggested resolutions to the alert. To view full knowledge information, click View additional knowledge from the Alert Details pane. Read the Product Knowledge and take action as described in the Resolutions section. If necessary, launch the Console Tasks defined in the Product Knowledge. You can use the information in the alert to implement a rapid response and maintain system availability. For additional system data, you can view the HP System Management Homepage on the individual server or use HP SIM to manage multiple systems. Use the tasks provided with the Product Knowledge. The Computers view shows all HP computers managed by HP Insight Management Agents, HP Insight Management WBEM Providers, and the hosted Microsoft® applications. This view shows the health state of each computer and you can use Microsoft® tasks as defined in the Microsoft® Computer class. 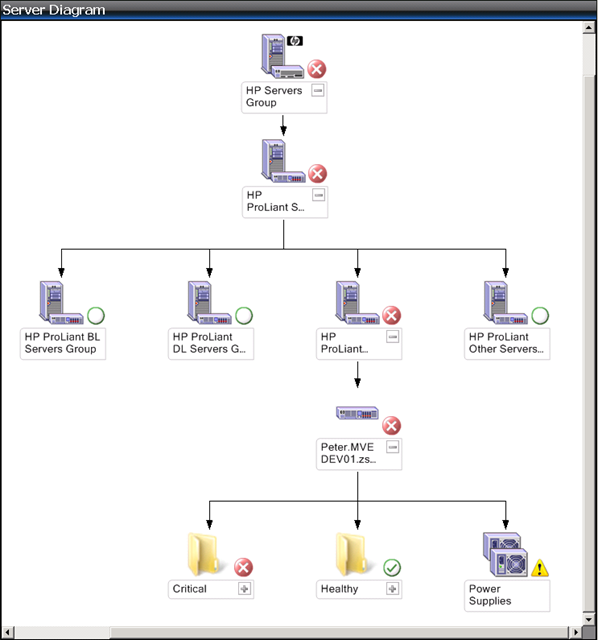 To view associated HP information, right-click the server entry, and select Open>Diagram View. This view will show the relationship between HP Server and Windows® Computer classes along with other managed classes under the Windows® Computer class instance. The state of the HP Server class instance will be propagated to the Windows® Computer class instance. The Group State view shows each Server Model Group State propagating from underlying Server Models. To view members of HP Server Group, right-click the group entry, and select Open>Diagram View. 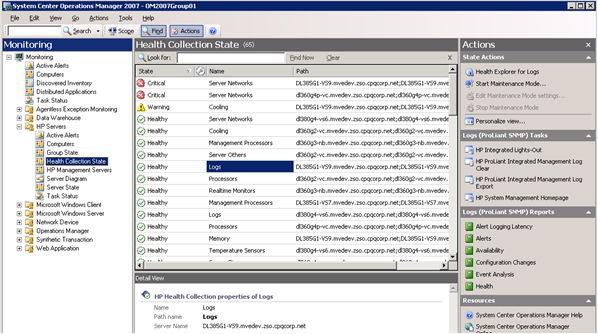 The Health Collection State view shows the state of all collections of HP servers. You can view all failed collections at once by sorting the State column. 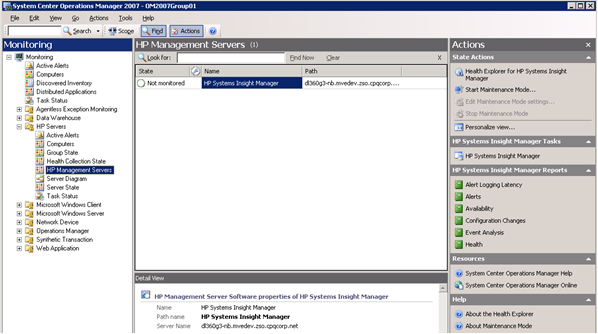 The HP Management Servers view lists all computers that host the HP Systems Insight Manager (SIM) application for cross-platform hardware resource lifecycle management. 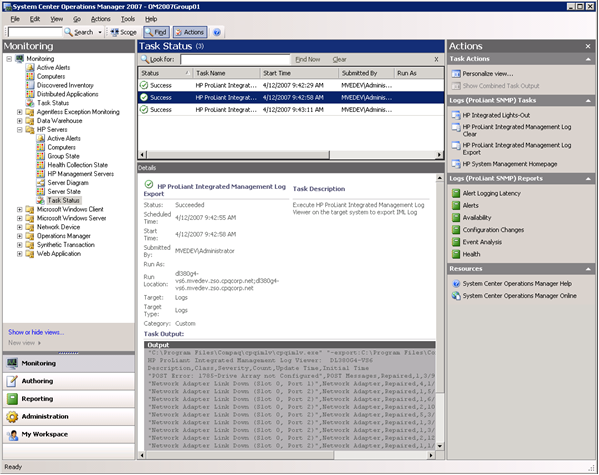 The HP ProLiant Server Management Packs for Operations Manager 2007 include a task that enables HP SIM to be launched within Operations Manager 2007. 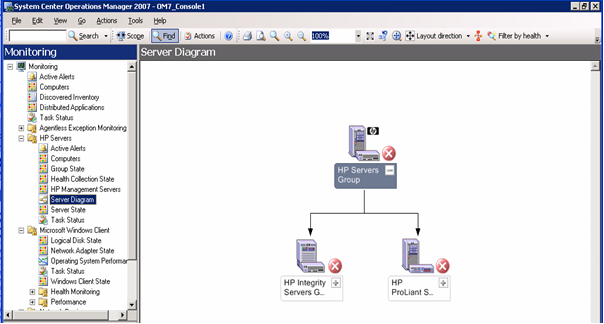 The Server Diagram view provides a graphical display of groups and associated HP servers and subsystems (collections). HP ProLiant servers are displayed in the Server Diagram pane. Expand each icon node to drill down to the next level of information. The Server State view displays the overall status of HP hardware associated with the listed computers. 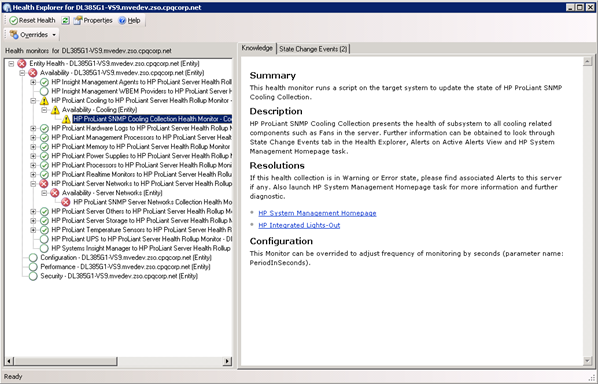 To view detailed state information for HP health collections for a computer, select the computer, and launch Health Explorer from the Context menu or from the link in the Actions panel. The Health Explorer can be launched from the State view and the Diagram view. It displays the result of state propagation in folder style. The Health Explorer automatically expands those folders in which red or yellow states are observed. Select the last node in the folder to get knowledge information, and then select the State Change Event tab to view state change history. The following figure is an example of Health State Change history and state property bag data. The property bag data contains a list of properties with Health State Update and Failed Component information. Other Health Collections that were not described previously, display N/A to indicate there is no further information available for the failed component. For detailed diagnostic information, launch the HP System Management Homepage. 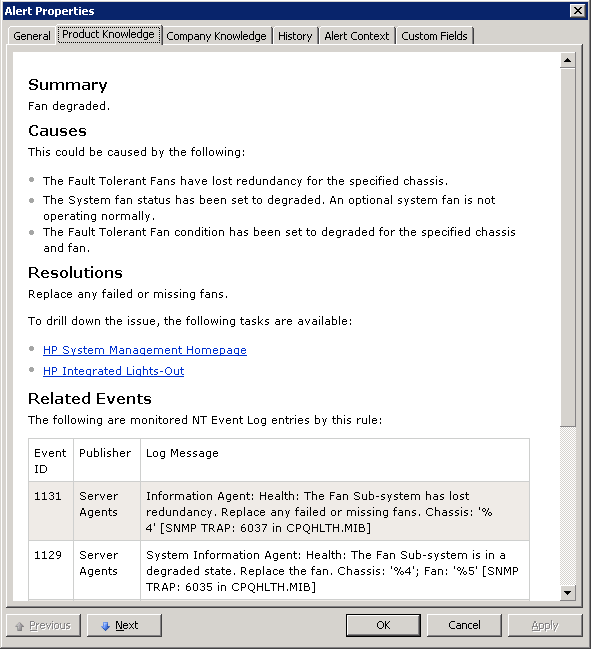 Diagnostic scripts are run to get component level failure information on an HP ProLiant server. Results of these scripts are intended for debugging failed or warning health monitors in the HP ProLiant Servers WMI Management Pack. These scripts are associated with each HP ProLiant Server WMI Health Monitor and run automatically when the state of a monitor changes. All diagnostic script output has information about all the components on the server. All diagnostic scripts only run when a state change has occurred. If a health collection stays in the Warning state for multiple component failures at multiple times (observed with component redundancy sets), the diagnostic script only runs the first time the state change occurs. To see new failed components in such a situation, the script must be manually run. See “Manually initiate diagnostic scripts” for more information. The log collection health monitor does not have diagnostic script. You can see the output of these scripts from the Health Explorer for a monitor. The following is a sample output of a script. 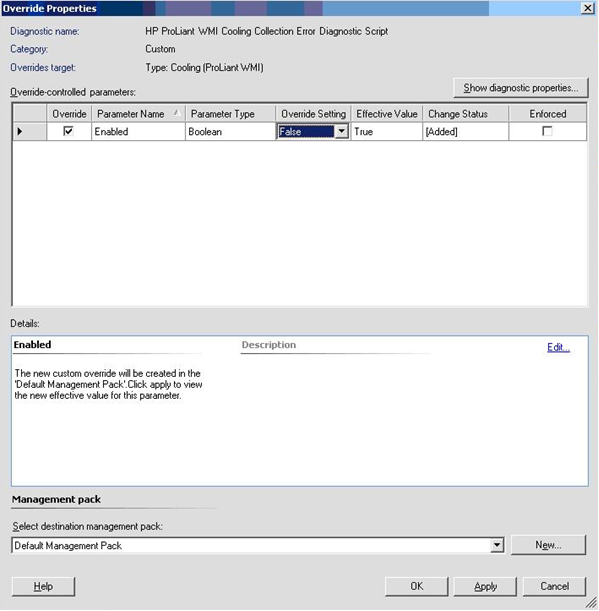 The following table lists all diagnostic scripts and their associated monitors in the HP ProLiant Servers WMI Management Pack. Select a monitor and open health explorer. 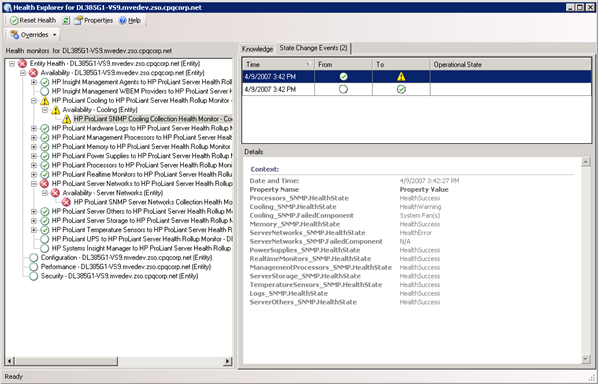 Select the HP ProLiant Server WMI health collection monitor, and then click the State Changes tab. Choose any of the above listed state change events, and then click the diagnostic script name. NOTE: The latest data output produced by manually run diagnostic scripts are from the execution process. 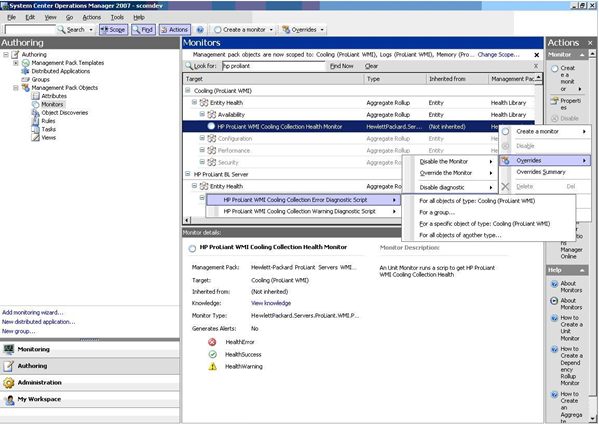 Select the HP ProLiant Server WMI health monitor from the Authoring>Monitors screen in Operations Console. Right click the monitor, and select Overrides>Override Diagnostic. Select the script name, and then select if it is for a specific object or all objects. Check the override checkbox, and then select False in the Override Setting for the Enabled parameter. Click Apply, and then close the Override Properties window. 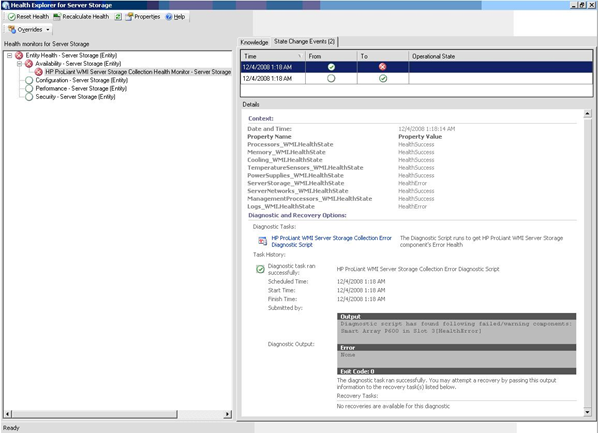 There is no specific view to the HP ProLiant Servers WMI Management Pack. All views are shared with the HP ProLiant Servers SNMP Management Pack.